Samsung ATIV Q tablet runs Android and Windows | What Hi-Fi? Samsung has launched two new ATIV tablets running Windows 8, the ATIV Q and the ATIV Tab 3. Neither has a firm release date or price as yet but they're slated for launch "later this year". While the ATIV Tab 3 – "the world's thinnest tablet" – runs standard Windows 8, the ATIV Q can run both Android and WIndows apps and operating systems. 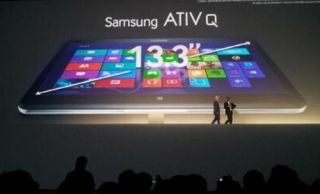 The ATIV Q is also a "convertible" device, combining the functionality of a tablet and a notebook PC thanks to a "hinge design" that allows the Q to lay flat or stand upright. Also super-slim, measuring just 13.9mm thin, it weighs just 1.29kg – not bad considering it sports a whopping 13.3in touchscreen display complete with a 3200 x 1800 resolution. That makes for a 275ppi pixel density. Elsewhere it has Intel Core i5, Intel HD Graphics 4400, 4GB memory and 128GB SSD hard disk drive. The ATIV Q battery life is set to be up to 9 hours. It has USB and micro HDMI slots. Also on the lean side, the ATIV Tab 3 claims to be the world's slimmest tablet, at just 8.2mm thin and weighing 550g. The Samsung ATIV Tab 3 runs Windows 8, can run all Windows apps and programmes and comes preloaded with Office Home and Student. Back once again on this Samsung tablet is the S-Pen stylus. There's a 64GB HDD, Intel ATOM Z2760 processor and a 1366 x 768 screen. Launched at the Samsung Premiere 2013 event, we're about to get hands-on with the new products for a closer look.